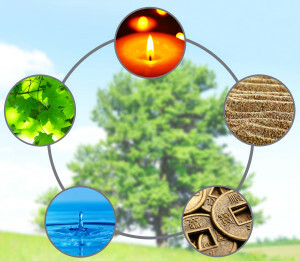 In Five Element acupuncture, each season is related to an element. Spring is the time related to the Wood element. Each season brings about a new energy into the world. Spring is a time of new birth and upward growth as buds begin to shoot up through the ground. It is a time of making plans and acting on ideas. It is a time of change marked by the powerful urge to push forward into life. Each of the Five Elements correspond to specific organs in the body and Wood is associated with the liver and gall bladder. Signs that these organs are out of balance can appear as symptoms such as insomnia, anxiety, headaches, menstrual disorders and irritability. I hear about a lot of anger and frustration from patients in the spring when the energy is shifting into the Wood season. Treating the liver and balancing the energy will help alleviate these symptoms resulting in frustration giving way to creativity, as insomnia and anxiety begin to ease. Balanced energy enables one to live more harmoniously as the natural change of season unfolds. Spring is also a time to change from the heavier diet of winter stews and root vegetables to a lighter fare of fresh greens and sprouts. Dandelion greens, spinach and arugula are good to eat now, as well as fennel, scallions and chives. All of these foods help cleanse the body and support the liver. Additionally, exercise plays an important role in detoxifying the liver. This is a good time of year to renew your commitment to your exercise regimen. Margaret Ryding, M. Ac is a Five Element acupuncturist. Five Element acupuncture is based on natural laws, helping patients to live in greater harmony with nature and the seasons.